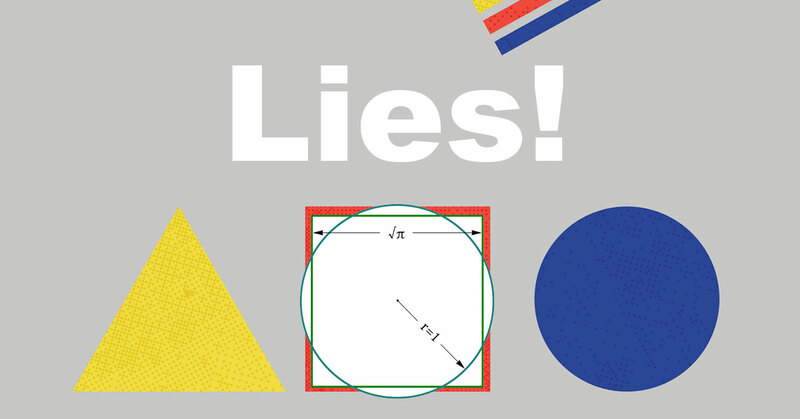 There are No Straight Lines or Perfect Circles - Fact or Myth? Straight lines and perfect circles don't exist in reality, all perfect shapes are mathematical abstractions. Straight lines and perfect circles don’t exist in reality; they are mathematical abstractions. Therefore, there is no perfect line or circle in the entire universe (and unless you count imperfect shapes that constantly change at the quantum and molecular level as “perfect”). In reality, all objects are three-dimensional objects in spacetime made of quanta, there are no exceptions. We can represent a straight line or perfect circle with mathematics (the basis of geometry), or we can approximate it on paper or using a computer (the visual part of geometry), but we can never actually create a straight line or circle. Luckily, approximating gets us close enough for geometry to be useful. The further we calculate a number, and the more pixels we use, the closer lines get to straight, and circles get to perfect but alas, a truly perfect shape is never created. Like “infinity,” which is well represented in pi when calculating the ratio of a circle’s circumference to its diameter, straight lines, and circles (and thus all perfect shapes) are metaphysical and theoretical. They are concepts that speak to real things, but they are not themselves real physical objects. The concept of perfect shapes is a sort of transcendent rational thing of both metaphysics and physics. Simply put, there are no perfect shapes in material reality. MUSING: So “is geometry a lie” or “are we misunderstanding the universe by looking for perfect reflections of all our rational ideas in the material universe?” Or C, neither/both. “Everything you’ve learned in school as ‘obvious’ becomes less and less obvious as you begin to study the universe. For example, there are no solids in the universe. There’s not even a suggestion of a solid. There are no absolute continuums. There are no surfaces. There are no straight lines.” – Quotations by R Buckminster Fuller. (This quote was initially on a similar topic on Quora; it has been re-published here). Can a Circle Be a Straight Line? | Space Time | PBS Digital Studios. A circle can be a straight line, but straight lines and circles don’t exist. It’s all just simple physics. FACT: “Everything is essentially light.” Unknowns like dark matter aside, everything known in the universe is “mass-energy in motion” with a few properties. One property of all matter and its building blocks is the electromagnetic charge. Given that electromagnetism “is light,” we can very loosely say “everything is essentially light.” Light is a quantum particle, a photon, a distortion in the electromagnetic field. It always travels light speed in a single direction unimpeded, but its nature is one of the probable locations in a transverse wave. It does not exist as a definite location or a straight line. Thus, nothing made from that essential stuff can be a straight line either (in fact, it is all at its core quantum). Neither graphite, nor pixels, nor nature herself can create a straight line or a truly perfect curve. Thus perfect shapes are impossible objects. FACT: The only shape that is real is essentially the fractal (a chaotic shape). All perfect shapes are approximative. FACT: In a closely related idea, one can’t square a circle using only a finite number of steps with compass and straightedge. Geometry deals with the representation of perfect shapes using mathematics, it doesn’t deal with perfect shapes directly. Squaring the Circle – Numberphile. You can square a circle, but you can’t square a circle using only a finite number of steps with compass and straightedge. There is no such thing as a perfect line, square, circle or shape in general (unless you could imperfect shapes as perfect). Is there such a thing as a straight line or a perfect circle in the entire Universe?